I have drawn the winner of my Mooo Design gift certificate. 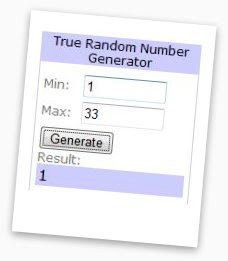 So just what is the probability of #1 appearing when one uses a random number generator? Anyone, anyone? I don't think I was paying attention in maths that day. And others for that matter. I dread the day the boys ask me for help with their quadratic function homework. Congratulations to the lovely Beck - you were #1. Keep an eye out for your certificate which will arrive by e-mail. Enjoy! And thank you very much to everyone who took the time to enter the giveaway. Stay tuned for another one coming up very soon. I looked at that site. I wanted the tree wall set - the whole thing!! No, I don't have a wall big enough and blank enough to put it on. No, I can't afford that much in sticky things.